Looks pretty wet doesn’t it. But don’t be scared at the forecast, read the forecast closely. Is there anything that screams “full day washout?” To my eye, there is one day with just potential. That day is the 9th, in our example, “rain and a thunderstorm.” Everything else looks like typical Florida weather. Some afternoon thunderstorms or rain showers. Nothing that will greatly impact park plans. In all of my Disney trips in the past seven years, I have only experience one day where the weather greatly impacted my plans. That was on my most recent trip where the Walt Disney World area experienced a tornado warning in the morning and received 10 inches of rain for entire day. You can read about that day and my Be Our Guest Lunch Review here. Even on this day, there were breaks in the weather where we could head into the parks and go on the attractions. When it did rain, however, it came down in sheets. I am also a big proponent of downloading an app to your phone which can give you weather updates in real-time and even push notifications about “thunderstorm warnings” and other severe weather. The app that I prefer is the Weather Underground app which can be found as “WUnderground” when doing a search in the App Store. It provides real-time weather radar and allows push notifications about severe weather. The thing that I really like about the app is the ability to see the current weather and the weather radar on the home screen. 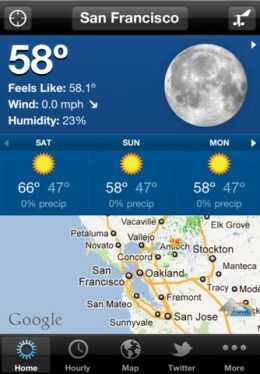 This allows you to see the current weather and what the weather could be in the future. You can use this information to get in line for an indoor attraction or show before the weather moves in and everybody is looking for an indoor attraction or show to wait out the rain. The radar updates about every three to four minutes when the app is open. What weather can close the parks? Since I was at Walt Disney World during a tornado warning, the tornado warning was not enough to close down the park (although it did thin out the crowds and a lot of outdoor attractions were closed). The only weather which can cause the parks to close is a hurricane and even then the hurricane has to have some direct impacts on Orlando for the parks to close. A hurricane making landfall in Miami or Jacksonville isn’t going to close the park necessarily unless is a really wide hurricane. Walt Disney World does have a hurricane policy in place for those who are traveling to and from the resort as well as for those guests who are at the resort. In August of last year, I did a whole blog article on Walt Disney World and hurricanes which includes a link to Walt Disney World’s hurricane policy. Hurricanes are an extremely rare event. There are only about 10-15 hurricanes per hurricane season which runs from June 1 to November 30 with peak season in August and September. 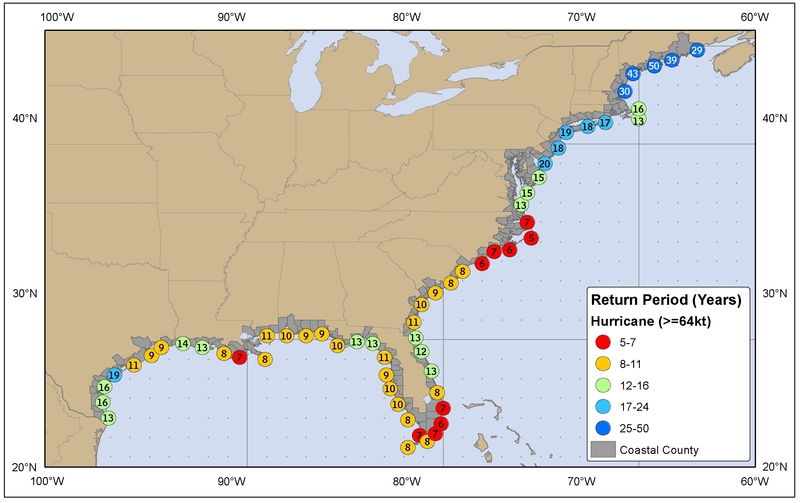 Below is a map which shows how frequently hurricanes make a landfall along the US coast. Hurricanes strike the area that Orlando is around about once every 10 to 13 years. Another thing to keep in mind is Orlando is roughly 50 miles inland so the strongest effects won’t be felt in Orlando but along the coast. Orlando will still have some impacts and some with will be strong but not as strong as the impacts along the coast. I hope this article gives you an idea as to what to do in the parks when it does rain, what you can do to stay “ahead of the storms”, and what weather will cause the parks to close.